Townsend's warbler (Setophaga townsendi) is a small songbird of the New World warblerfamily. These birds have a yellow face with a black stripe across their cheeks extending into an ear patch, a thin pointed bill, two white wing bars, olive upperparts with black streaks on their backs and flanks, and a white belly. Adult males have a black cap, black throat and yellow lower breast; females have a dark cap and a yellow throat. Immature birds are similar to females with a dark green cap and cheeks. Their breeding habitats are coniferous forests with large trees on the northwestern coast ofNorth America. Their nests are shallow cups built with grass and lined with moss. These nests are usually placed atop a branch in a conifer. The female lays 4 to 5 brown-speckled white eggs. 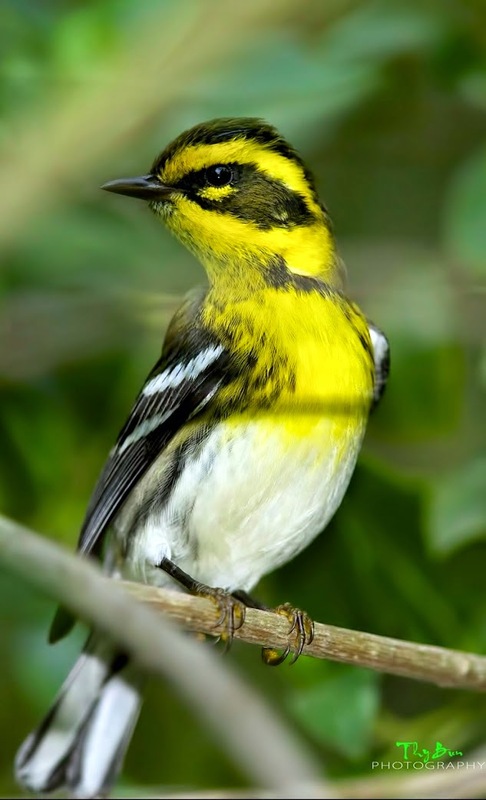 This bird is closely related to the hermit warbler, and the two species interbreed where their ranges overlap.